Major League Baseball's draft took place on June 5-7 and over the past week there has been a flurry of players signing and reporting to affiliates. The biggest news came on Tuesday when first rounder Michael Chavis (pictured, right) signed with the Red Sox for $1,870,500. Joon Lee at Over The Monster spoke with some evaluators to see what they thought of Chavis who enters the SoxProspects.com rankings at 12. On Monday, news of early signings started to break with five signings reported including first-round pick RHP Michael Kopech, second-round selection 1B Sam Travis, as well as 1B Josh Ockimey, CF Trenton Kemp, and CF Tyler Hill. Four of the five signings got slot value or above, with Kopech the only exception signing for $178,000 under slot. The next day, the Red Sox confirmed the signings reported on Monday and also announced five late round signings as well: 23rd rounder CF Derek Miller, 31st rounder C Alex McKeon, 34th rounder RHP Kuehl McEachern, 37th rounder SS Hector Lorenzana, and 38th rounder RHP Brandon Show. Saturday saw four more added to the list, headlined by former ninth-overall pick RHP Karsten Whitson. Other players to sign were OF Danny Mars, LHP Jalen Beeks, SS Jeremy Rivera. One final player was signed last week, third round pick Jake Cosart, a pitcher out of Seminole State College of Florida who signed for slightly under slot. The Red Sox are currently $79,800 over their bonus pool, and check out the bottom of the post for a list of signed players and their bonus amounts. The signing deadline is July 18. News of signings were not the only announcements that came in bunches. The week was also chock full of promotions. As SoxProspects.com staff writer James Dunne relays, the biggest news was 17-year-old Rafael Devers is reportedly going to be promoted to the Gulf Coast League imminently after absolutely demolishing the DSL, with a line of .379/.476/.636. SoxProspects.com staff writer Luke Lavoie covered the promotions of right-hander Joe Gunkel , third baseman Jantzen Witte, and catcher Jordan Weems who were called up to Salem earlier this week. As part of this transaction, the Red Sox also released right-hander Kyle Stroup. The week got off to a rough start with The Office of the Commissioner of Baseball announcing that Miguel Pena had been suspended 100 games for testing positive for a drug of abuse. It was Pena's third positive test since turning pro, and James Dunne has the full write-up. As a result of the Pena suspension, right-hander Luis Dias was promoted to Double-A Portland as SoxProspects.com's John Gray writes. He started Wednesday's game and didn't need much time to adjust, pitching six innings while allowing only one hit (a home run) and striking out four. With the Red Sox designating Grady Sizemore for assignment, they needed a hitter to fill the hole. Their choice was to recall third-basemen Garin Cecchini as James Dunne writes. To add to his versatility, the Red Sox had Cecchini make his professional debut in left field this past week after returning to Pawtucket, and WEEI.com's Alex Speier has Cecchini's reaction to the new position. SoxProspects.com executive editor Chris Hatfield had a very busy week, appearing on both Alex Speier's Minor Details podcast and on Over The Monster's podcast to discuss the recent Red Sox draft picks. The hottest topic among writers this week was whether the Red Sox should call up top prospect, Mookie Betts (pictured). Betts has been playing a lot of outfield recently to make himself more versatile, which is necessary with Dustin Pedroia manning Betts' main position at the major league level. You find people on both sides of this topic. Joon Lee at Over The Monster says definitively that now is not the time to call up Mookie. Tim Britton of the Providence Journal looks at it from both sides, and also speaks with coworker Brian MacPherson about the idea on their podcast. With Betts hitting .344/.429/.526 split between Double-A and Triple-A on the year, the side advocating for his call-up to shock some life into the struggling offense is growing. Rob Bradford of WEEI thinks it is time, and so does the Boston Herald's John Tomase. While the Red Sox continue to add depth to their system, Alex Speier looks at the system's already impressive pitching depth and how that can be a big asset in various ways to the major league team. “The Red Sox, who are planning an aggressive strike on the international market this year and will go well beyond their international bonus pool,” writes Baseball America’s Ben Badler. In this article he profiles the top pitchers on the international market and three of them are linked to the Red Sox. Former Red Sox farmhand and major league starter and reliever, Daniel Bard, has been released by the Texas Rangers after signing with them this offseason as a minor league free agent. Bard has never been able to get it back together after moving into the rotation in 2012, and this was never more clear than this year where he faced 18 hitters and only got two outs, all while pitching in Low A. This week we had our latest edition of the SoxProspects.com featured videos. This one featured infielder Victor Acosta, shortstop Mauricio Dubon, and outfielder Joseph Monge try to hit major league relievers Koji Uehara and Junichi Tazawa. 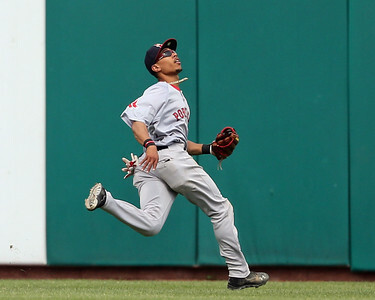 Photo Credit: Michael Chavis by Baseball America and Mookie Betts by Kelly O'Connor. Will Woodward is a Staff Writer for SoxProspects.com. Follow him on Twitter here.